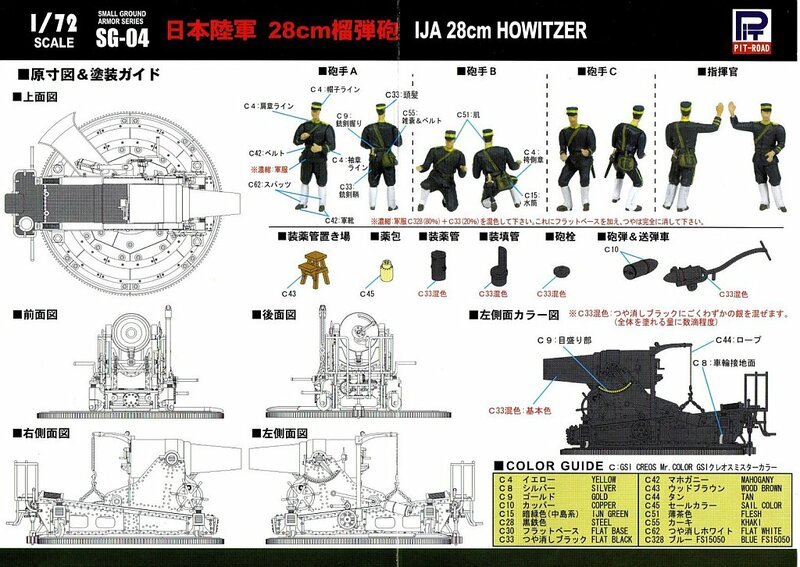 The 28cm (11 inch) IJA howitzer was built by the Osaka Army Arsenal, patterned on an Italian gun designed for them by the British. 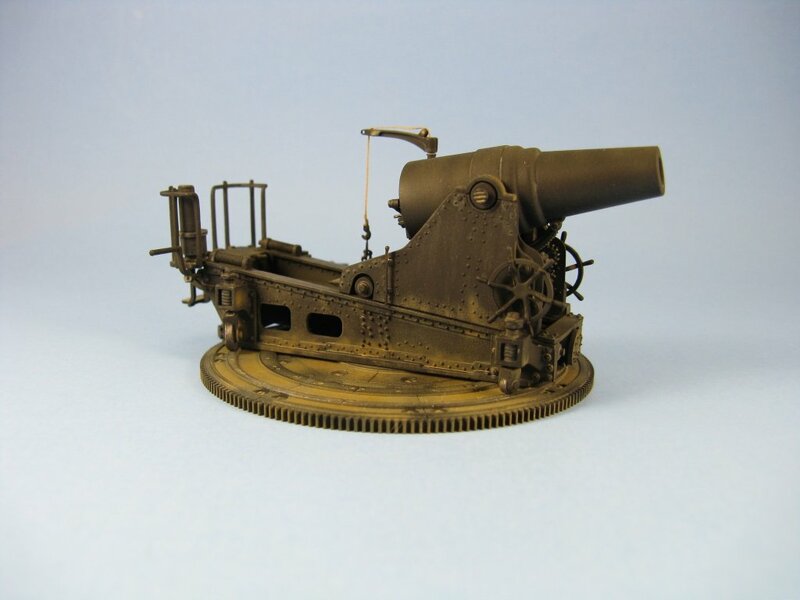 The gun was officially adopted for production in 1887. 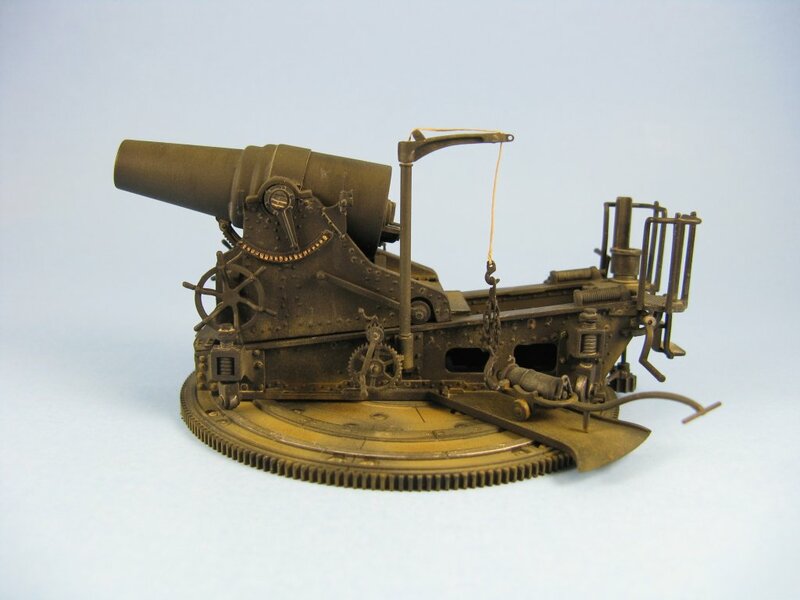 It was used against Russia during the Russo-Japanese War just after the turn of the 20th century. 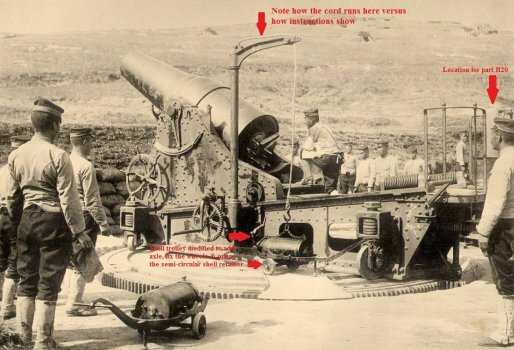 In late 1904, six of the guns were used in the capture of Hill 203, and then employed in the siege of Port Arthur in Manchuria. 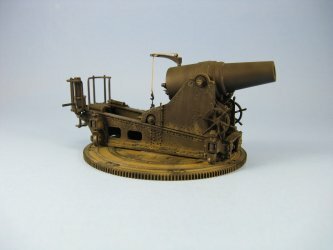 Over the course of the next few months the howitzers were used to devastating effect on the Port itself, as well as sinking four battleships, a pair of cruisers, and damaging one more battleship, and in early 1905 the Russians surrendered after most of their Pacific Fleet had been destroyed. The guns were also used again during World War One. 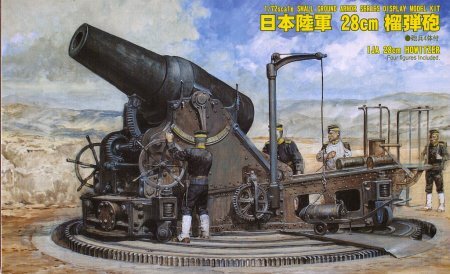 At this time Russia and Japan were allied against Germany, and Japan provided some howitzers to Tsarist Russia, some of which were captured by the Germans during the course of the war. During the 1930s the guns were modified for towing by a 13-ton tractor, and subsequently used again against Russian forces at the Amur River in what was to be the beginning of the Khalkhin Gol/Nomonhan War. 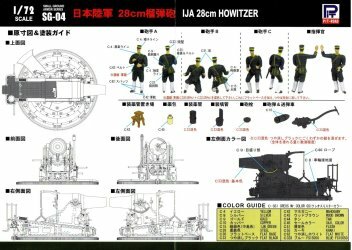 The howitzers also appear to have been in place as coastal defence around Tokyo Bay and Western Japan during World War Two. Parts are moulded in a medium grey colour. The plastic is a bit on the hard side compared with other manufacturers but still quite acceptable. Pieces are spread over four sprues. This totals out to 89 plastic parts altogether. There is also a short length of thread enclosed in a small bag. No decals are included. 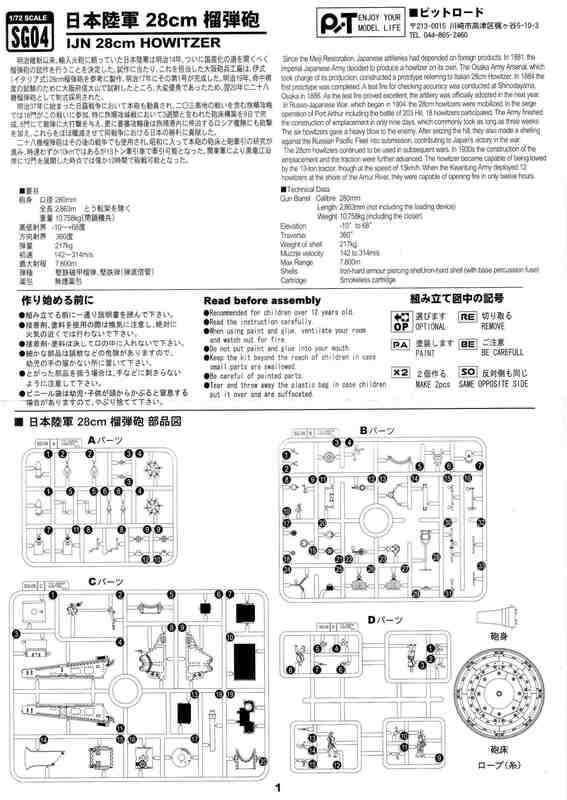 The instruction sheet is very well thought out and easy to follow with 16 steps for the build. A separate painting guide printed in colour is also included. Detail is excellent throughout. For example the grip pattern in the tread plates on the gun carriage is exquisitely represented. Only the indifferent figures detract from the overall quality. Mould alignment is excellent showing only very faint seams along most of the parts, though Sprue B does exhibit a bit more mould shift than the others that leaves slightly larger seams. Ejector pin marks are few and the vast majority of them are in places where they won't be seen, or are covered, once adjacent parts are in place. Construction was straight forward, requiring few deviations from the build sequence. The modular design of the real gun as well as for the kit makes it easy to build the model a separate subassemblies which can be painted and then put together at the end. 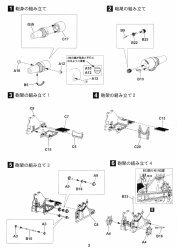 Parts fit, which is exemplary throughout, is not an issue with this kit making assembly a breeze, though there are a few points to note. Instructions don't really show it but the gears (parts A3/B15/A3 and A9/B18/A9) in Step 5 will need to mesh together when mounted in the carriage. In Step 10 I found it easier to add the parts individually to the carriage instead of trying to put everything together first and then trying to fit the assembly into place, that is, glue B31 then B13 to the carriage, then glue B21 to B23, then add the shaft B32 (which I replaced with a piece of plastic rod cut to size), and finally slide the B21/B23/B32 assembly into place making sure that gear part B21 meshes with B30 added in Step 9. When adding part C14 in Step 11 temporarily join the carriage to the turntable before gluing the part in place. This will ensure that it sits level. At Step 12 I made my only major deviation from the instructions. First was the crane (part C2) which I modified based on my reference photos. A hole was drilled in the top of the vertical shaft, and another smaller hole at the tip just behind the loop. 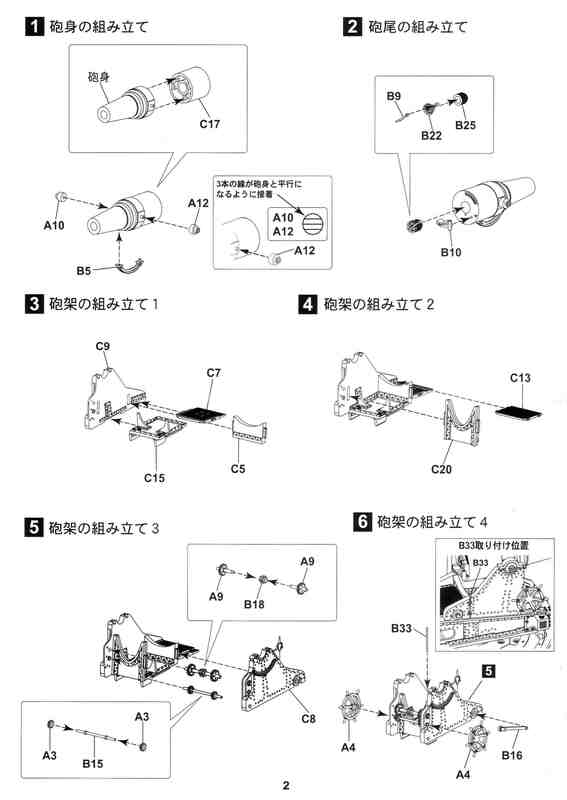 Photos show that the cord does not attach to the loop on the end of the crane's arm, as shown in the instructions, but instead passes through a hole in the arm just in front of another pulley. I did not use the thread provided for the hoist. I've always found thread to be too furry for use as cable. Instead I used some braided fishing line. The kit's chain (part B26) is moulded so it can be attached to the front (part B8) and rear (part B2) mounts glued to the shell in Step 12 but I wanted the chain to hang loose and have the trolley displayed with a shell in place and ready to be hoisted, so I substituted some metal chain for the plastic version in the kit, and went to my spares box to replace the two hooks found moulded on the kit's chain. One hook was super glued to one end of the metal chain and the other was twisted onto the end of the fishing line. The new cable and chain were not attached to the crane until final assembly following painting. I also modified the shell trolley by cutting off the moulded on wheels and added new ones punched from a plastic sheet. The an axle is missing so it was added as well with a short section of plastic rod. At the front of the trolley I cut off the semi-circular brace so I could mount it in the open position and add a handle. While holding the carriage assembly upside down, I inserted the wheels into their slots. 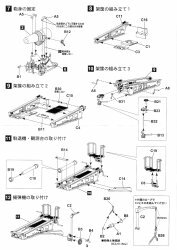 While everything is still upside down, slip the turntable into place and then turn the assembly right side up while holding the carriage and turntable together. Gravity should pull the casters down to touch the turntable. In my case one of the casters was stubborn and would not come down so I pulled it down with some tweezers. Lastly apply a drop of liquid glue with a paint brush to the point where the wheels enter the carriage and hold a while to allow the glue to dry. 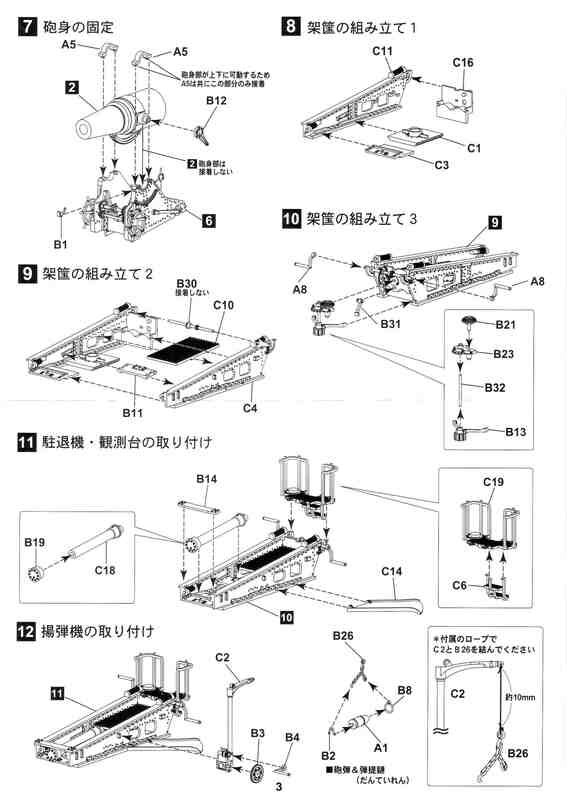 Then place the assembly on a table and let sit until completely set. In my mind the caster wheels (parts A2 & A6) would have been better served if they had been multi-part assemblies with the wheels and the caster separate. The railing on the rear platform (part C19) was thinned with copious scraping using my hobby knife. I had really wanted to replace this with bent wire but had no idea exactly how to do this, so I settled on scraping the plastic pieces instead. Many of the smaller parts were left off until the painting was finished to prevent breakage. 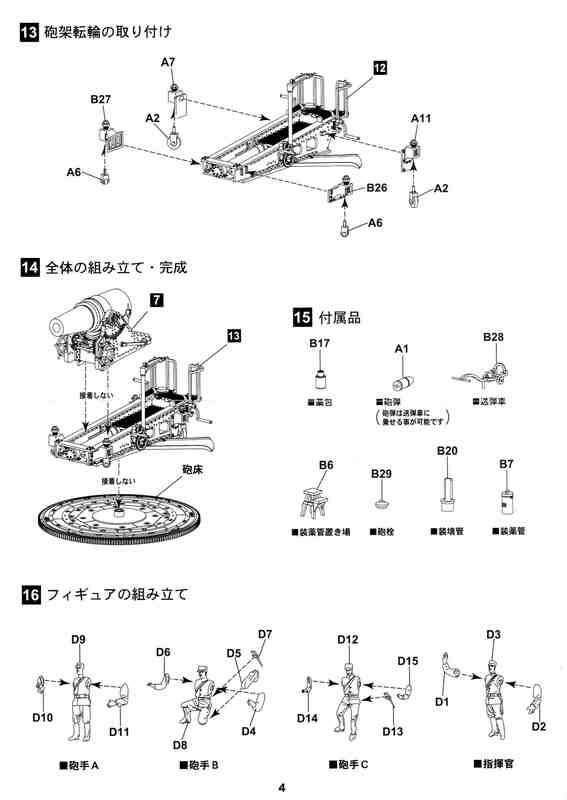 This included part B33, the two elevation wheels (part A4) & the crank handle (part B4) for the crane. From a couple of reference pictures it appears that the two barrel elevation wheels (part A4) should be mounted so that they are 45os out of sync with each other, i.e. the handles should not match up side to side. 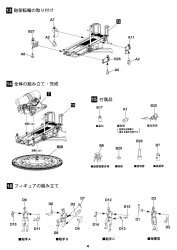 The same applies to the turntable cranks (2 x part A8) that should be 180os out of sync as shown in the instructions at Step 10. The screw breech assembly (parts B9/B22/B25) made in Step 2 is just a smidgen smaller than the opening at the rear of the barrel so care must be taken here to avoid having it sit crooked. 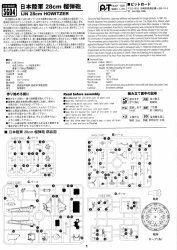 The parts at Step 15 are all separate and are not referenced in the previous steps of the build. Most are obvious as to what they are, such as the stool (part B6), the muzzle cap (B29) and shell trolley (B28), but I have no idea exactly what part B20 is. I eventually glued it to the rear platform as per a couple of my reference photographs. About the only really let down in the kit is with the gun crew figures. The bodies are moulded well enough, but the faces appear to be quite indistinct. The body of the tallest figure (part D9) measures out to about 0.86in, or approximately 5ft 2in in real life. This is quite short but probably reasonable considering the stature of the average Japanese soldier of the period. Initial coat was an overall covering of flat black (Floquil Engine Black F110010). I didn't bother with my usual light grey primer. A cloud pattern inside panel lines with flat black mixed with a fair amount of dark brown (Testors Dark Earth 2054). Spray on a coat of Testors Glosscote straight from the aerosol can and let dry for a few days. A pin wash of light tan (Testors Afrika Dunkelgrau '42 3103) on various edges and rivets, and I also ran some down the flat sides of the cradle and carriage in a few places. 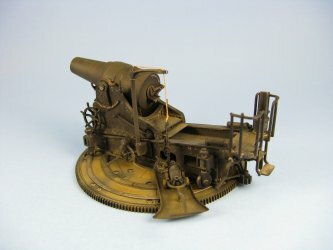 Dry brushed with flat black (Testors 1749) to reduce the starkness of the pin wash.
Airbrushed a light coat of light tan and dark brown mix on the lower parts of the carriage and gun cradle. Added a lot of the same mix to the turntable. Another dry brushing of flat black to again reduce the airbrushed tan/brown done in the step above & add some streaking from rain. Dry brush of Testors Silver to gears and the track that the caster wheels travel along and on the top of the gun carriage where the cradle runs up the carriage during recoil. With my finest brush, paint some gold onto the angle indicator marks on the cradle. Let dry thoroughly and then pin wash around the indicator marks with some flat black to cover any gold slopped outside the edges. Ran a mechanical pencil over the caster wheels to give them a bit of a shine to represent wear from the moving of the gun on the turntable. This has to rank as one of the easiest models I have ever put together. Fit is superb, detail is superb, no sink marks, and almost all ejector marks are in places you can't see them once the pieces are all together. 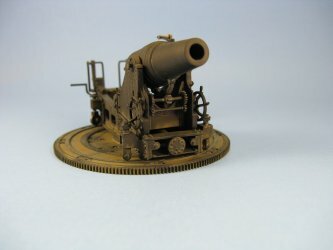 Sure, you could if you wanted, detail it a bit more, like making better caster wheels, or replacing the plastic springs with scratch built items, but why bother really. The kit is absolutely superb straight out of the box. Highly recommended!